Allows for more than one breaker to be locked with one padlock. 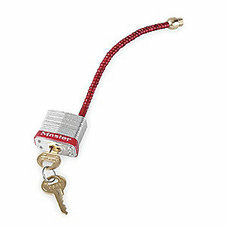 Compact Padlock features a 3/16in (5mm) diameter cable shackle to allow proper lockout of all types of circuit breaker lockout devices. Device fits the tight space constraints within circuit breaker shutoff boxes.